Australian Gourmet Traveller has all the information you need to find the best food, the greatest chefs, travel destinations, and hotels in Australia. 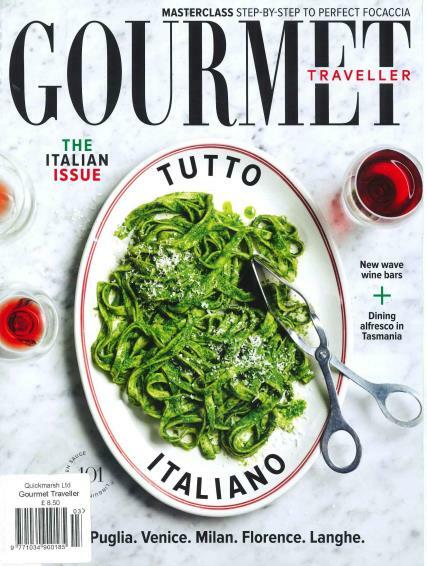 Buy a single copy or subscription to Australian Gourmet Traveller magazine. The magazine is the top selling food and travel magazine in Australia. The Magazine has the spectacular photography of both travel locations and food that you would expect from a food and travel publication. In addition, the magazine has top writers in both food and travel to inspire and fascinate readers. The magazine has great recipes, menus for hosting dinner parties, luncheons and brunches at home, insider news on the restaurant scene, and educated information on wine. The travel destinations including large resorts, bed & breakfasts and everything in between is enticing and enthralling. An article a recent issue includes a list of the magazine’s restaurant awards for the year. There is also an in depth feature article about travelling to and around Bangkok. The information in the article includes travel and flight information, hotels, restaurants, hot spots. There is reassuring information on the political climate and the areas recovery from the devastating floods which hit the area in recent years. Thailand’s Prime Minister, Yingluck Shinawatra is determined to make Thailand and Bangkok a thriving travel destination for tourists. The entrepreneurs in Thailand have responded with restaurants, hotels and bars specifically catering to expats and the affluent visitor. In Australian Gourmet Traveller, you will also find recommendation for terrific drives in Australia including the high country and the wine country, the hottest in boutique hotels in Sydney, and the best wine bars in Australia, The magazine also names the top wines of Australia and provides incredible recipes from great Australian restaurants including the chocolate banana French toast with salted caramel topping, Roast rhubarb parfait brioche, pork belly ravioli, and bread and butter pudding.